On the Cover: The blue planet Neptune and its tantalizing moon Triton are the last scheduled destinations on Voyager 2's Grand Tour of the outer solar system. Jupiter, Saturn and Uranus have all given up secrets to this robotic emissary from Earth, and the spacecraft will now probe the secrets of its last planet. After swinging past Triton and examining its atmosphere, Voyager 2 will begin a quest to find the edge of our solar system, and then will travel on forever through the realm of the stars. 4 Putting Voyager Together: William McLaughlin delves into the history behind this historic mission. 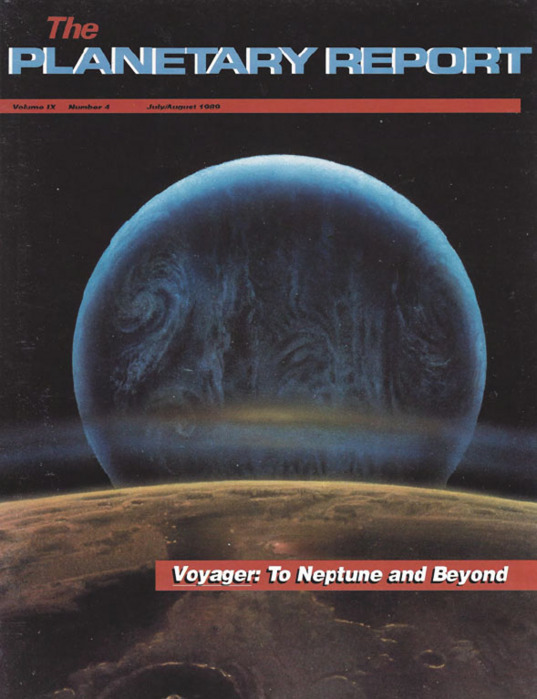 8 Jupiter: First Stop on Voyager's Grand Tour: David Morrison summarizes Voyager's results from the Jovian system. 12 Saturn: Jewel of the Solar System: Jeffery Cuzzi highlights perhaps the star of the Grand Tour. 16 Uranus: Beneath That Bland Exterior: Richard Simpson and Ellis Miner show us just how interesting the Uranian system really is. 19 Voyager 2 Approaches Neptune: Ellis Miner tells us what we might expect to see when Voyager 2 makes its final stop in our solar system. 23 The Voyager Interstellar Mission: Dan Finnerty looks at what lies ahead for the Voyager spacecraft once they leave our solar system. 3 Members' Dialogue Statement on the Soviet space program. 22 World Watch Views of Mars from Phobos 2. 26 News & Reviews Interstellar distances. 27 Society Notes Awards, prizes, and contests. 28 Q&A How do Voyager and Pioneer operate under the harsh conditions of space?